Today we visited the traditional bakery “Bonino”, a small family business being managed by Gianni and his wife, in order to see how bakery products are made manually according to methods used since ancient times. All phases of the work are done manually, preparing the dough in a kneader being the only exception. Here, breads are made following the tradition of the Langhe area, before being baked in a wood-fired oven. The oven is heated the evening before baking should take place such that the temperature of the oven is optimum in the morning. Gianni told us that he used a month just to understand the basics of the oven, and more than a year in order to obtain the products he wanted. The ingredients of the breads are: plain white flour, cold water, salt and yeast. The kneader mixes the ingredients slowly in order to ensure that their characteristics are maintained even after having been mixed. For Gianni, the dough is alive and it has to be treated gently, meaning that overheating must be avoided at all costs, and not stressing it by speeding up the preparation, besides allowing a slow and gradual leavening. The leavening is carried out by putting the dough on a table, protecting it from sudden temperature changes and drafts which could be harmful and destroy a night’s work, a work which begins at 4 in the morning. When the leavening is halfway, Gianni and his wife, divides the dough into bread-sized pieces and put them on shelves near the oven in order to let them be ready for the baking. In order to obtain an an optimum bread, in addition to a certain manual ability, it pays to know about and use natural ingredients of prime quality. As Gianni told us: “Using first-rate flour makes a good bread and it’s easy to make one”. 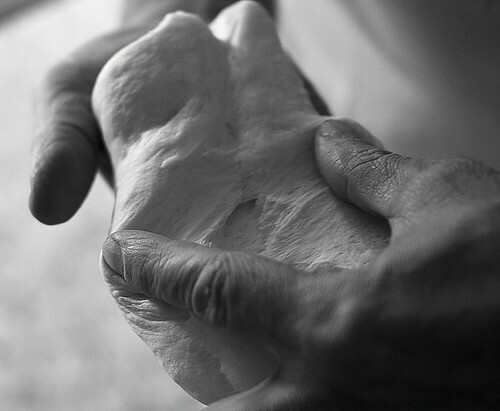 Since the dough is a living thing, the weather also influences his work. For instance, it’s easy to make bread in dry weather, while you have to vary the amount of yeast, water and the baking time when it’s humid. Gianni also told us that by adding chemical additives, the influence of the weather will disappear, but this is against his principles.